South West Pass of the Mississippi River. 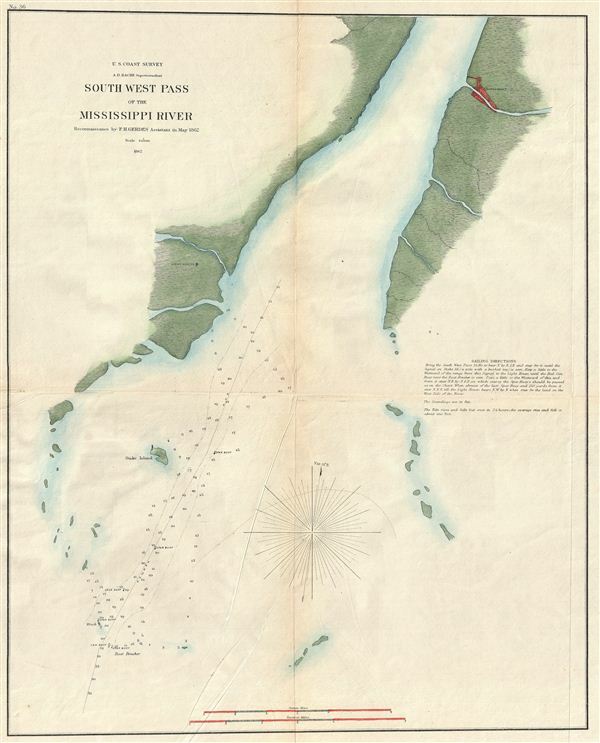 A fine example of the U.S. Coast Survey nautical chart or maritime map of the Mississippi River's South West Pass. The Southwest Pass, as it is known today, is one of the channels at the mouth of the Mississippi River and has been the main shipping channel in the Mississippi River Delta since the Coast Survey first mapped it in 1853. It empties into the Gulf of Mexico at the southwesternmost tip of the Mississippi River Delta. This area became particularly important at the outbreak of the American Civil War, when the Union Navy, with vastly superior surveys courtesy of the Union leaning Coast Survey team, was able to blockade this and other river passes, essentially closing the Mississippi to southern reinforcement from the Gulf of Mexico. The chart features numerous depth soundings as well as notes on lights, sailing directions, and a wealth of additional practical information for the mariner. This chart was compiled by F. H. Gerdes, the Coast Survey's resident Gulf expert, for publication under the superintendence of A. D. Bache in the 1862 edition of the Superintendent's Report. Very good. Backed with archival tissue. A few creases and minor wear on original fold lines. Else very clean.